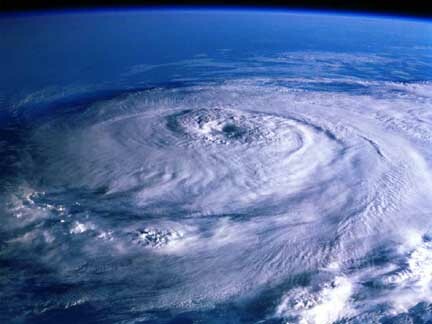 I have so many friends and relatives on the East Coast who are being and will be affected by Hurricane Irene. I am thinking about all of you today and through the next few days, I hope that everyone rides this out safely and that nobody is harmed through this storm. Property can be rebuilt or repurchased, lives cannot. Be safe! Tonight we'll take advantage of Park-n-Ride and go to the State Fair for dinner and walking through some of the exhibits. This is our time - a chance to see the Fair before my friend Sharon arrives next week. I'm looking forward to being back at the fairgrounds, having a foot-long hotdog or a pronto pup, and seeing some of the exhibits. It's a crazy thing to look forward to, but I do every year without fail. Yippee! Yeah, love those hot dogs. The pic is truly amazing and beautiful in a very scary way.